The following pages are for paid up Members only and contain detailed information about certain types of maps, including identification codes and tables showing years and states for which certain maps were issued. Map Trader is a classified ad community for Road Map Collectors Association members wishing to sell, buy or trade maps. Visit the Map Trader section of the website to browse through maps members are selling or maps members are looking for. If you are looking for maps to buy for your collection, or have some maps to sell, posting a classified ad is very simple, just Place and Ad on the Map Trade page and fill in a few fields. Remember, Map Trader is for members only and it is up to you to contact the member who posted the Ad. The Petroleum Map Catalog Containing more detailed information than the US and Canadian Oil Company Lists (below), this section of the Members’ website seeks to list all known issues by brand, section and year, identifying the cartographer for each map. Currently it is restricted to North American issues (including Mexico). It has now been fully updated from the original paper catalog, incorporating several thousand additional maps discovered over the last 20 years and runs to 34 extensive pages, broken down by major brand or alphabetically for smaller names. If you have an update to the catalog, then we’d love to hear about it – just send an e-mail to Stan DeOrsey and Ian Byrne. 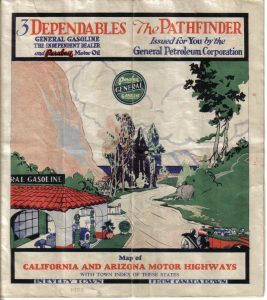 There are also two comprehensive lists that can be downloaded in PDF format showing all American Oil Companies and Canadian Petroleum Companies that issued road maps. This includes first and last known years of issue for all companies and, in most case, a brief note about it. Official Maps Master List – UPDATED! This contains a separate page for each US state or Canadian Province, listing all known issues, including variations and map codes. To report a map that has not been cataloged or to update the Official Maps Master List, just send an e-mail to Mark Greaves. Commemorative Event Maps – a pictorial overview. Shows maps from the two New York World’s Fairs, plus other fairs such as the Great Lakes Exposition, the Golden Gate Exposition, Chicago’s Century of Progress and Hemisfair. ACSC Map Codes As of 10-29-2012 – Developed by Brian Hatcher and Curtis Carrroll. They have spent many hours working to compose this list so a BIG thank you. Even though it still has some holes to fill, updates to the list will come as new data is obtained. Interpreting Rand Codes There’s a lot more detail than just the date that can be found from a Rand McNally map code, and this page explains how it can be deciphered. Master List Maps of J. Foster Ashburn & the Ashburn Map Co.
A page of zoomable 1919 maps showing routes to Stockton (where we held the 2012 West Coast RMCA swap meet) taken from a 1919 ACSC set of strip maps.